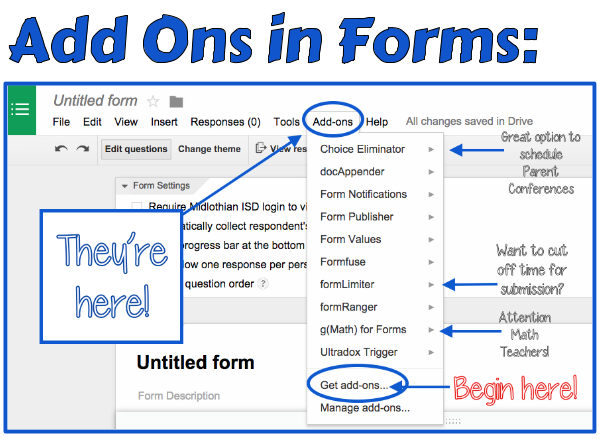 I love Google Forms and with the proliferation of Scripts and Add Ons mostly thanks to New Visions for Public Schools' Cloud Lab, teachers now have the ability to automate tasks like never before! But this update just in! To make fabulous forms even better, Google introduced Add Ons directly in forms! Need to add those beautiful equations in your next quiz? Add them directly in Forms with the gMath Add On. Want to eliminate answer choices as they are selected, i.e. selecting parent conference times? Use the Choice Eliminator Add On. Check them out! They are right there in your Forms now! 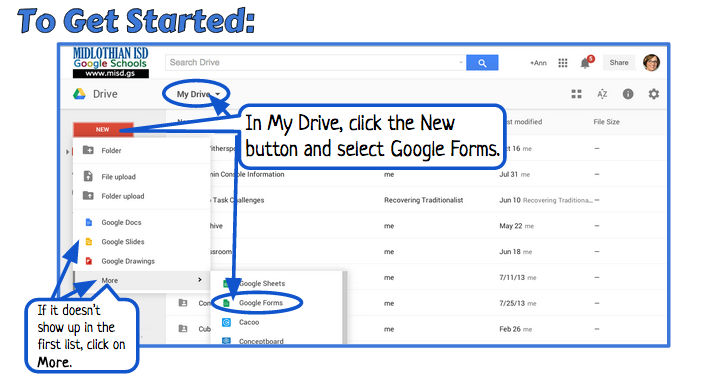 Here was the blog post from Google Drive announcing this addition. Want to get started? Check out the graphic below. Creating a Google form isn't hard. And with all of the most recent updates, the possibilities for creating dynamic, beautiful forms is even easier! I know there's a lot of information here, but if you're not familiar with Google Forms, poke around and refer back to this graphic. 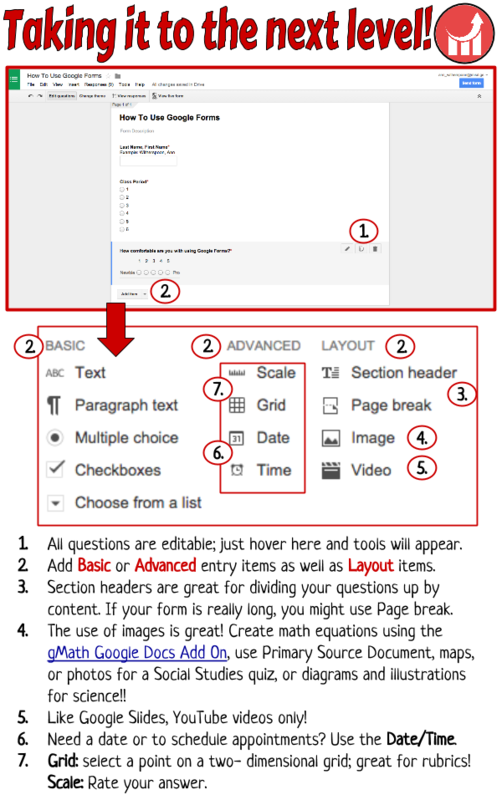 With the addition of images, math teachers can use the gMath Add On in Docs and Sheets to create equations for math quizzes. (The developer, John McGowan, is a great educator who every math teacher needs to follow!) The use of images is also a great way to structure social studies questions analyzing primary source documents with standardized testing type questions. The possibilities are endless. Features such as randomizing questions or just answer choices makes it harder for students to copy from their neighbors. I will admit right off the bat I have a love hate relationship with YouTube. With all of the amazing content uploaded daily, there is no denying it provides the richest learning experiences at your fingertips. It has become my go-to for all types of tech help. Since we have become a Google Apps school district, it makes it very easy to upload tutorial videos needed for training. Many teachers are utilizing this feature as well for their classrooms. Therein lies the problem...while our teachers aren't blocked from YouTube, students are, so using this uploaded content for learning opportunities that aren't teacher-directed, these videos become unusable...but not at home in a flipped environment. Another issue has been the "Related Videos" that populate the right side of the interface. Can that be turned off? No. Can it be manipulated? Yes! Tag your videos properly! Your video's metadata is what helps YouTube select their 'suggested videos' that appear on the video player screen. Check out the graphic below that details how you can make the most out of your YouTube account to maximize student learning opportunities. Also, since our district uses iBoss for our filter, they offer a YouTube Clean Search. 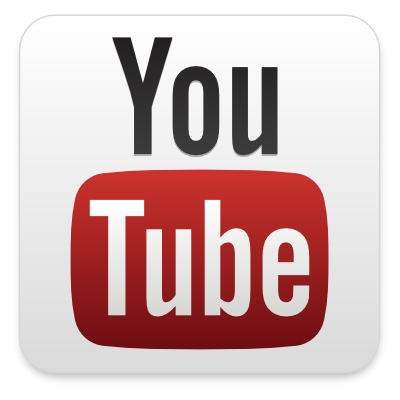 Students are able to view YouTube videos using the URL addresses they create for the YouTube videos. I've also included a graphic that details how to maximize this service for student learning and projects. The final installment in this four part post on using social media in the classroom explores the use of Edmodo as a means for making learning social. Sure we use Edmodo as a learning management system. We post assignments, have students submit their work, take tests, but do we maximize it as a social media platform that capitalizes on making learning social? Let's explore some ways you can accomplish this. Create similar, but different posts that are divided into groups with prompts such as writing prompts, content-specific graphics, current events, vocabulary, content-specific questions. Allow students to select which post to respond and comment to and require them to also comment on someone else's post eliciting conversation on the post selected. Using the "Poll" tool, post multiple polls on different content concepts and let students select which poll to respond to. Then require student to reply why they selected that poll. Have students post as a particular individual related to a book, video clip, battle, mathematician, scientist much like Tweeting or Facebooking. Looking for ways to connect your content to the world around us? Create a Scavenger Hunt or I Spy type activity and have students post those discoveries from their homes, their daily experiences, their interactions, their travels OUTSIDE the classroom. This can be event or holiday related. Select a "Student Guest Post" each week to engage fellow classmates in "collegial conversations" about your content...yes this will initially have to be modeled and maybe you will need to start with your PreAp/Ap classes, but I have always found students rise to the expectations placed before them. Have you ever thought about a "Group Quiz"? Create several quizzes with a group A,B,C, etc label. Don't randomize the questions. Develop questions that inference content, that challenge their thinking, that foster conversations about the content. Have students group together, research, analyze, and discuss the questions collaboratively. This is an opportunity for students to develop the type of thinking needed to analyze those state-mandated tests. Understand, they want to post to Edmodo...make that work for you and provide them them content-related postings to which they can respond. I realized over Christmas holidays the first year I began using Edmodo that students were just posting random things during the holidays...take advantage of that! I love the Edmodo blog in which they enlist educators to post things they are doing in the classroom...ways they leverage Edmodo. While I love Edmodo and all it has to offer as a learning management system, it's just so easy to fall into the trap of narrowly utilizing all it can provide you in the classroom. Reach out to the many educators on Edmodo, open your mind to the many opportunities this tool can provide in making learning social. When you do, you are engaging and empowering your students to learn in ways that are everlasting...beyond the classroom walls. In this third installment of using social media in the classroom, another interesting option is introducing blogging to your students. This gives students an opportunity to develop communication skills, to reflect on their learning, and to share their perspective on the world around them. There are, however, several tips and tricks to maximize effective blogging in the classroom. Explore the resources presented to discover ways you can leverage blogging in the classroom. Set clear expectations and requirements with regards to writing. Include goals for what you are trying to accomplish, i.e., integration of content skills. So many times we fail to really detail where we are headed and what skills and knowledge the students will acquire as a result. Detail school guidelines with regards to FERPA, acceptable use policies, and digital citizenship in general. Plagiarism is rampant. This is the perfect forum to spotlight this. Read other blogs, dissect them, have students evaluate them and analyze where they want to go with their blog. This is an important piece to the planning process. The selection of the template and how the blog is organized must require some pre-planning. Detail typical grammatical errors and good writing practices. Blogging is a great way to implement content standards with a real-world connection. This is a great opportunity for students to find their voice. Look for opportunities to collaborate with professional bloggers. This would be a great "entry event" to introduce blogging to your classroom. There are also opportunities to collaborate with other classrooms around the world. Take it a step further and map the connections. An easy way to do this is to embed a Visitors Map Widget. Require students to comment on classmates' blogs. This has a twofold purpose. Students learn to formulate meaningful comments that further conversations. The other benefit here is it encourages them to write in a way that ignites conversation. Current Events-this is a great opportunity to make global connections. Daily Journal-are you having your ELA students journal everyday? Take it to the cloud, provide an authentic audience, and give your students the opportunity to develop their voices. Interview scientific experts in their field using the Marcel Proust format. Exploring mathematical thinking-have students reflect and connect math to their world. Help them develop mathematical thinking through blogging. Interview mathematical experts in their field using the Marcel Proust format. 'I Spy'-have students hunt for math in their world. This is a great way to make connections to math in their world. This is a great way to add video and pictures to their blog. In this second installment of using social media in the classroom, we're going to discover the use of Instagram and its versatility in the classroom. 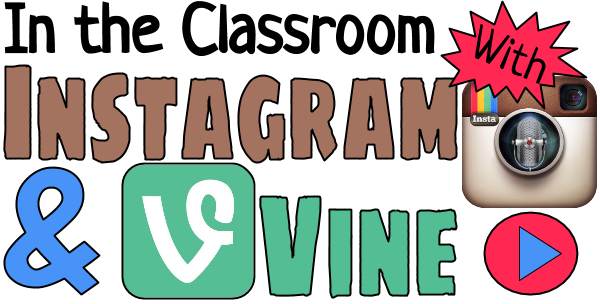 I've curated many different resources and ideas for using Instagram and Vine in the classroom. Hopefully, you'll find something you can use. Here are 10 awesome ideas in one blog post! What if Martin Luther King, Jr. had an Instagram account? Here is another activity asking students to imagine if book characters had Instagram. Create an Instagram scavenger hunt! informED listed 20 out of the box ways to use Instagram in the classroom. EmergingEdTech also listed 5 ways of using Instagram in classrooms. Can't decide which to use? Here are a couple of videos that demonstrate the power of Instagram and the Micro-video in the classroom. Many teachers have introduced the use of social media in their classrooms and capitalized on its use as a way to give students voice, choice, and an avenue for collaboration. Meeting students where they are, integrating what's important to them with the necessary content to be covered, engages students and creates an environment that learning is social. It is all around us and is ongoing. I love the quote that we are as smart as the smartest person in the room. Are we communicating that to our students? Below I have compiled some resources for a variety of tools that make learning social. This post is going to be part one of a four part series on the use of social media in the classroom. Part one will focus on Twitter. I often wonder how I lived without Twitter! 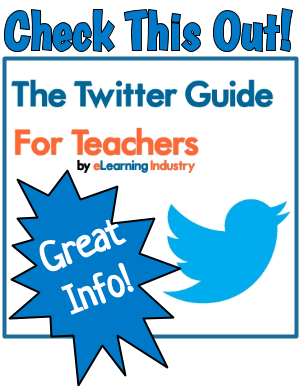 Check out these resources to gain more information on Twitter and how it can be effectively implemented into your curriculum. Just click on each graphic. 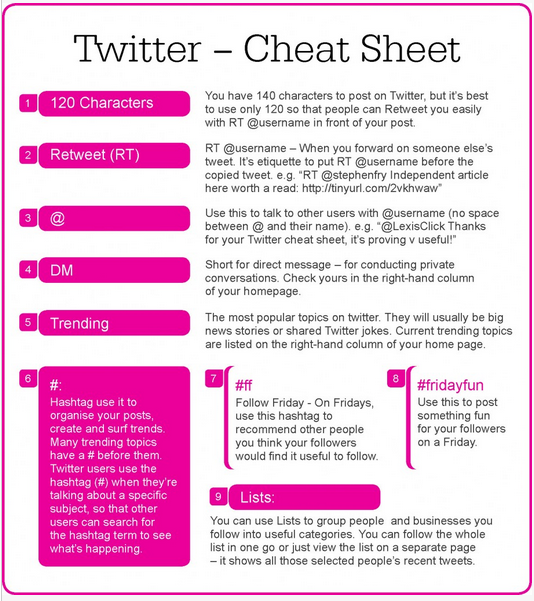 Check out this Twitter Cheat Sheet from Edudemic, This is some great, basic information. Ready to discover some ways to leverage Twitter for social learning? Really that's the only kind of learning on Twitter! 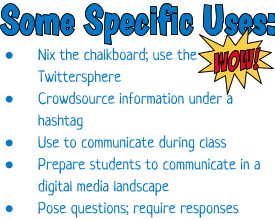 And it's not just for student learning...Twitter is rich with resources for teachers by teachers. Need an activity for a particular concept? Check the Twittersphere. Case in point...I couldn't figure out how to create a leaderboard with certain parameters. My #1 Twitter Smartee, Alice Keeler (@alicekeeler) came to the rescue and, via a Google Hangout with her, developed the leaderboard to all specifications! That girl is a Google Ninja! 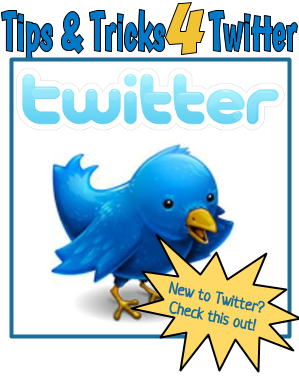 Click on the graphic below to discover some tips on using Twitter for social learning.